If you have any moles in or around your face like I do, or some spots, this is very good stuff if you cut them. I found I needed a generous blob for this to work. Once applied the gel acts like an invisible plaster, which for me meant the blood spread out a little bit so you might to use something else e.g talcum powder if you’re about to go out and about. I think this gel would also be good for people on blood thinning medication too because it would act quickly. Works well no stinging puts a clear seal over nick stops bleeding instantly. Nice subtle smell that won’t choke your fellow commuters of a morning! Recommended. Wow! Stops any bleeding almost instantly and you only need the tiniest amount. A small tube but will last for ages. Worth every penny. Terrific and quick service from Shave-Lounge as well. It’s great to be able to find a supplier of original shaving products that you can’t find elsewhere. The gel is a wonder, you only require a little drop on your finger, apply it and wait a few seconds, job done! Brilliant far better than the pencils. I usually get away with shaving with zero cuts – but have a bar of alum on standby. The odd little nicks were plugged within a second – with NO pain, unlike with the alum block, which stings somewhat. Where I had sliced the top off a mole, there was much blood – but the Proraso capped the well within 10 seconds… with a little stinging. 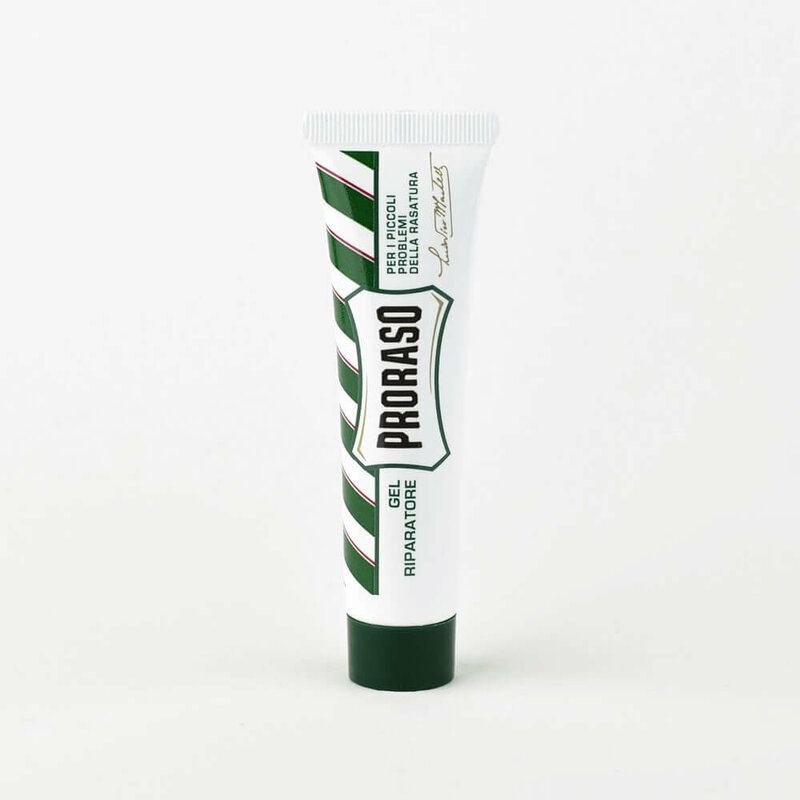 I already use Proraso shaving products so thought I’d give this ‘Cut Healing Gel’ a go. It’s brilliant & even better than I expected. It dries the cut up instantly with the smallest spot of gel & so is economical too. If you’ve not already tried it, I highly recommend you do. The service from Shave Lounge is excellent too. Very quick delivery. This was my first purchase from Shave Lounge & I will definately be using them again. Spread a tiny amount onto a shaving nick and it stops the bleeding in an instant. Wish I had had this when I started shaving many years ago! Recommended. I have always used a styptic pen but inevitably they break and you end up using pieces or throw it away. I thought I would try this for a change. It’s a gel that seals just as fast as a pen, but no breakages and no waste. Only downside is the gel takes a little time to dry. Having just switched to double edged shaving, I thought I’d give this stuff a whirl as I’m always nicking myself. It’s fantastic stuff. Just the tiniest drop stems bleeding from cuts and it does it without stinging your face to high heaven. Having ditched the expensive multi blade razors for a much closer and cleaner shaving experience (of course, using the other wonderful Proraso products) I am relearning the art of DE shaving. Even with the brilliant Merkur razors I am still adjusting to the process, the no. of passes, cream soap mixing, the angle etc. Inevitably at this stage there has been a few incidents with a few minor nicks. But have no fear as there is ‘magic healing’ available in this little tube. A small dab afterwards on the affected area and, voila, problem solved. Thankfully my shaving has improved but it’s good to know, isn’t it, that just a simple wave of this ‘magic wand’ is available when needed? Usual excellent service and speedy free UK delivery from Shave Lounge helping to keep the costs down when you just want to buy one of these as a one-off for the shaving cabinet or emergency medicine box. Wise to keep one in, so what’s stopping you?…izzy wizzy let’s get busy…..